Dublin, Ohio, USA, Jun-14-2017 — /EuropaWire/ — LSP Technologies announces the sale of its state-of-the-art Procudo® 200 Laser Peening System to the ZAL Zentrum für Angewandte Luftfahrtforschung in Hamburg, Germany. The equipment is being delivered to the ZAL TechCenter in Hamburg during the 3rd quarter of 2017, and being used to study metal fatigue enhancement applications for the civil aviation industry. Laser peening is a proven method for significantly increasing the fatigue life and fatigue strength of metals. The mechanical surface enhancement process utilizes a high-energy pulsed laser beam to impart compressive residual stresses up to twenty times deeper than shot peening. The compressive stresses introduced by laser peening add strength and robustness to metal parts by improving their resistance to damage, fatigue, crack initiation and crack propagation. Benefits of the process include: extended component service life, reduced maintenance and repair costs, improved part performance, and enhanced resistance to failure. The process has been employed for years by major aerospace OEMs including GE Aviation and Rolls Royce. LSP Technologies’ Procudo® 200 Laser Peening System is the only commercially available laser designed exclusively for laser peening. It employs a diode-pumped, pulsed YLF laser that produces a flat-top beam for smooth energy distribution and consistent processing. The flexible system offers selectable laser parameters, along with custom controls and diagnostics developed from LSPT’s 20 years of laser peening experience. 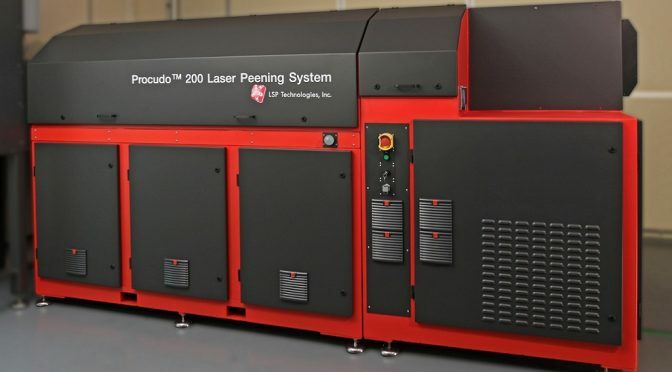 Engineered for high-volume production processing, the Procudo® Laser Peening System can deliver 20 pulses per second, making it the fastest laser peening system ever built. The Hamburg Center of Applied Aeronautical Research was established in 2009 as a technological research and development hub for the Hamburg Aviation Network. It is a public-private partnership that not only includes collaboration from some of the aviation industry’s largest organizations, such as Lufthansa and Airbus, but also from suppliers, SME, universities, research institutions, start-ups and many more. The ZAL TechCenter opened in Hamburg in 2016, and the 95-million-euro facility immediately became one of the largest and most advanced aeronautical research facilities in the world. LSP Technologies is the world’s premier laser peening services, technology and equipment provider. It is the only company in the world selling, installing, and integrating state-of-the-art laser peening systems into manufacturing and research facilities. The company has been providing laser peening production services for clients in the aviation and power generation industries for over twenty years, and has been awarded more than fifty patents for innovations in laser peening equipment and technology.